Air Canada recently made headlines when they announced a policy that would see parents paying a service fee of $40 on Tango fare tickets, for the privilege of sitting next to their own children. At issue was a two year old who would not be seated next to Mom or Dad unless they forked over the $40. Bowing to public pressure, Air Canada dropped the “cash grab” policy, but the fact remains that there are many rules and regulations around traveling with children, outside of sitting next to them, that you should be aware of before you take flight. 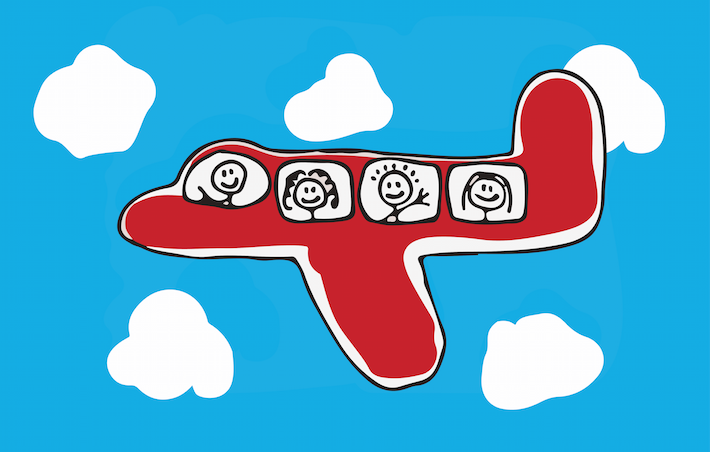 I looked at three different airlines and compared their regulations for kids’ travel. Air Canada: Infants can fly free within North America, seated on their parents’ lap, between the ages of seven days and under two years. There is a charge of 10% of the adult fare for International flights. If you want a separate seat for them, you will be charged full adult fare. You must book an infant ticket, even if they are sitting on your lap, when you book your ticket. Only one infant can travel per adult, and an adult is considered to be someone aged 16 plus. British Airways: As with Air Canada, infants can fly from seven days to 23 months, on a parent’s lap. However, there is always a 10% of adult fare fee charged. If you want a separate seat, they have a “Child fare” rate which is less than the adult rate. Once your child is five, you don’t even have to travel in the same cabin as them (have fun in Economy, kid!). United: Same policy as Air Canada on infant traveling for free on laps domestically, one infant per adult lap, and an adult is considered to be 18 years plus. If you want to send your child as ‘unaccompanied minor”, which is quite common today with families being spread apart, on Air Canada they need to be at least eight years old. From eight to 11, they must be registered in the Unaccompanied Minor program, which costs $100 CAD per child, per flight, regardless of fare paid. Once the child is 12, the program is optional. A 16 year old can accompany a child under the age of 11, as an adult. They will be likely seated in the last three rows of the airplane, where the flight crew can keep a close eye on them. Gone are the days when you can accompany them to the gate, unfortunately. You’ll say your goodbyes before customs and security. When I was a child, I flew “on” my mother’s passport. What that meant was either parent could simply add a child to their own passport. This no longer applies; each child, from birth, requires their own passport. If you are sending a child as an unaccompanied minor, they will need a birth certificate, health card and one other piece of government issued ID (for example a passport). Other tips? Don’t forget to ask about on-board bassinettes, which are great for tiny babies who can sleep comfortably (normally you have to have a bulkhead seat for these), and it gets them off Mom or Dad’s lap. Also ask ahead about children’s meals for fussy toddlers. Be prepared for some travel disruptions, and have plans to keep the kids quiet. Or, hope that Jet Blue will repeat their recent Mother’s Day program, which saw them give away 25% on a round trip ticket every time a baby cried, during a New York to California flight. Of course they had four babies cry, and everyone on board got 100%. I’m hoping that no one deliberately made their baby cry to get the discount, although it would certainly cross my mind.